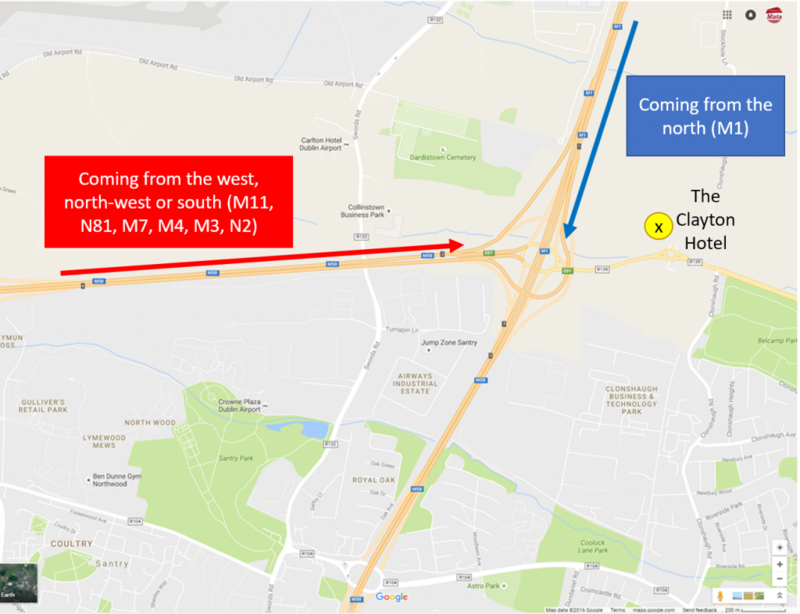 Approaching from the south (N11, N81, N7), west (N4) or north-west (N2, N3)…..
Travel north along the M50. As you near the exit for the M1 (signposted Belfast & Dublin Airport), the motorway splits into several lanes. Move to the right-most lane, signposted for the R139 (Malahide). Continue straight through the first roundabout (heading towards Malahide). As you approach the next roundabout, move to the left-most lane and take the first exit. You should see a sign for The Clayton Hotel. Park your car in the hotel carpark. Travel south along the M1. Continue on the M1 past the exit for Dublin Airport. As you approach the next exit, move to the left-most lane, signposted for the R139 (Malahide). Take the first exit at the first roundabout towards Malahide. As you approach the next roundabout, move to the left-most lane and take the first exit. You should see a sign for The Clayton Hotel. Park your car in the hotel carpark. Click here to get directions to The Clayton Hotel on Google Maps. Simply enter your starting point and click the search button.